Are you ready to quilt block two of Pat Sloan's Globetrotting quilt? I am! I considered adding a new theme to fill the four light green squares, but I think that I like the double continuous curve in there. I'll have to wait and see what the quilt wants once I start quilting it. Do you like this design? Do you have other suggestions? I'm hard at work getting ready for more quilting videos (soon, I promise!) and decided that Young Adult fiction was too old. This series is nothing but fun! 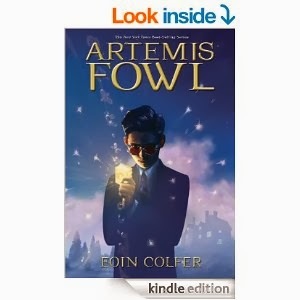 A child criminal mastermind kidnaps a fairy, Captain Holly Short, of the LEPrecon unit... and it goes on from there. The fabric is Moda's Chocolat from forever ago. I have quilted between 4,000 and 5,000 quilts. I've enjoyed working on most of them, but this one was something special to me. I can't explain why, but I was a little sad to finish this quilt. I enjoyed every minute I spent quilting this quilt. I petted it and cooed "You are a pretty girl, oh yes you are!" I have the kit for this quilt, still prettily packaged, but now have to get it out and make it so I can quilt it again!!! Aren't you glad I finally finished that huge quilting project and can post something other than "I listened to this book while quilting" posts? I feel a Stephen King binge coming on. 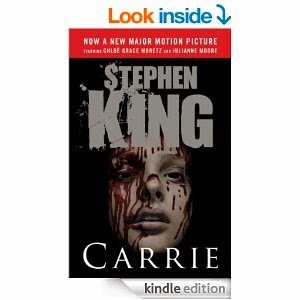 I read in publishing order and Carrie was published first. I wonder how long it will take to read through all of his works? My friend recommended City of Thieves by David Benioff. Set during the German siege of Leningrad, I don't think this is going to be a "happy" book but it might balance out the millions of bubbles I still have to quilt on "The Quilt That Shall Never End." 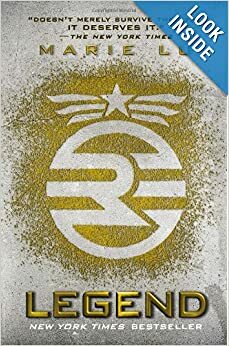 I've listened to the first 20 minutes of this book and have already heard them mention places I visited while I was in St. Petersburg (Leningrad). This is all Pat Sloan's Fault! Pat Sloan posted this. Another quilt along. Quilt alongs are apparently my kryptonite; I am powerless against them. Resistance was futile, so I pulled fabric from my stash and jumped right in. Meh. The brown just sits there, dead. No, I don't like polka dots. Why do you ask? True Confession: I have 18 projects on my UFO list right now. Sigh. I had to break my chain of Young Adult distopian fiction novels. Not because they aren't entertaining (because they are), but because they were all starting to blend together (a crying shame). I belong to a "Read the Classics" book club. This quarter we are reading Kim by Rudyard Kipling. I'm tackling this while I quilt this morning. I hope to fall in love with this shortly. I have been rearranging my thread collection. It's my excuse to fondle thread. 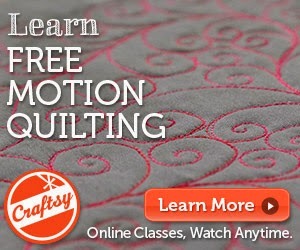 This is the first type of thread I used when I began longarm quilting in 2000. I no longer purchase this, not because it isn't good, but because there are so many other gorgeous threads on the market now. What surprised me was my color distrubution. How do I only have 4 different shades of red, but 11 shades of green? What color thread do you have the most shades of? And the least? I bought this fabric at Sturbridge Quilting and Sewing Center last weekend. Go to the shop, beause it's awesome. Ask if they can reorder this fabric for you, because my quilting buddies and I bought it all! The fabric is called Effervescence by Robert Kaufman. Hopefully their photos show just how gorgeous this is! Dark quilting studios aren't great places for photography. Shouldn't it be called an Advance? I was on a quilt retreat last weekend and had a truly mah-velous time! 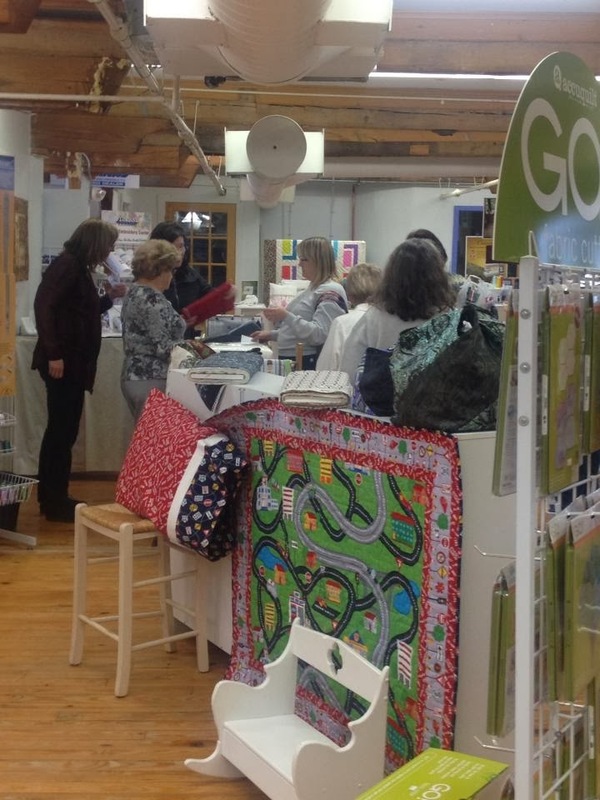 The retreat was hosted by Sturbridge Quilting and Sewing Center. They surely know how to throw a party! From Friday until Monday, all we did was sew, Sew, SEW! I brought several projects (ok, too many projects), but hoped to make progress on four of them. I made this little quilt on Friday night. I was planning post on YouTube how I quilt it, but I'm not sure that the thread will show up on camera. Time will tell. The pattern is called Turbulence. I didn't like this at all while I was making it. Once I sewed the blocks together, though, I fell in love with this quilt! I will probably make another one as there is now some dispute as to who is receiving this quilt. I had someone in mind, but someone else (cough*my daughter*cough) thinks they should receive it. I pretended that I was an archeologist and dug through my pile of quilt kits to find this beauty from 2005. I have some good kits buried in my studio and hope to pull more out to finish soon! I found a pile of quilt blocks and some fabric, but no instructions on how to finish this decade-old block of the month quilt. I took a few guesses and finished this top. The retreat was held at a conference center that proudly boasted "Kids' Week!" Oh, joy. We had children running around unsupervised and screaming until the wee hours of the morning. That wasn't so fun. What was fun, though, was that on Sunday morning a few girls came into our sewing room and asked if we had a few items for their scavenger hunt. These were some lovely girls and we adopted them. "How did you put a zipper in a purse?" The girls won the scavenger hunt and visited us several times during our stay. A few of our ladies donated some fabric and we let them make their own quilt blocks. Each girl received her own small purse to take home at the end of the weekend. Our stashes are much healthier now! 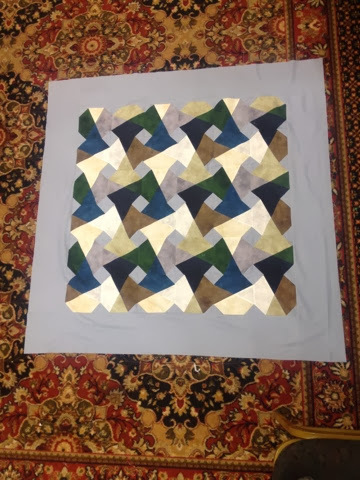 I don't know when I will next go on quilt retreat (quilt advance?) but I hope it's soon! Same Stuff, Different ... Book? I'm still working on the quilt-project-that-shall-never-end. I own a purse pattern called "The Potato Chip Bag." They claim that you cannot make just one. I used the Henna line from Makower. I bought the fabric at the Quilt Basket, so if you need it check with them. And about that "can't make just one purse" claim? Listening to audiobooks while I quilt keeps me sane. 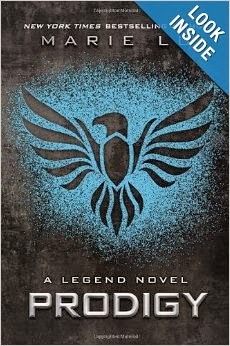 Yes, more young adult distopian fiction. I'm stuck in a rut but as long as this immense quilting project is taking to complete, my rut comforts me. Yesterday was not my favorite day ever. As I was quilting, I was also playing "What is falling from the sky?" Was it rain? sleet? snow? freezing rain? I think it was all of these, and a few more things I didn't think about. This mystery-precipitation, on top of 40+ inches of snow that just fell, was insulting. I had to run into town and amused myself by playing "How many mailboxes did the snow plows kill?" Answer: a lot. Once I realized that my quilt guild meeting was cancelled due to the mystery-precipitation, I drove home. I stopped to pick up my own mail and discovered that my mailbox fell victim to a snowplow as well. Not funny! My quilt kit arrived in the mail!!! My friend John Kubiniec designed this quilt and it was love at first sight for me. I HAD TO HAVE IT!!! I have a lot of work to do today, but I hope to sneak in a few minutes to work on this beauty today and every day until it is pieced, quilted, bound, and on my bed. I filmed every step of a quilt I finished for a magazine. This quilt taught me a lot and I wanted to share those lessons with you. The tutorials and video links can be found here. Not all of the videos made it into tutorials, though, so be sure to check out my YouTube channel. I made these 13 blocks about 10 years ago as part of a block of the month club. Finally, after "cooking" for a decade, I set these blocks. Hopefully I will get this quilted before another decade passes. Yes, I live in New York. I have lived here for 25 years and am well-accustomed to New York winters. This year, however, we've been cold (REALLY COLD) and we've had snow (A LOT OF SNOW). We've had bad winters before (2003 and 1994 come immediately to mind, but there were others), and this is right up there. I hated those winters, and I'm hating this one, too. Our heating bills are going through the roof. We're burning through our wood like it grows on ... wait... nevermind. Small businesses are suffering. And the worst thing? The very worst thing? I had to cut my own hair because I couldn't make or keep a hair appointment since the new year. I'm so grateful that I don't shovel (a car accident wrecked my back for good), but I feel so sorry for my poor husband out there every day, shoveling. This popped into my mind. Substitute "Shovel" for "Make the Donuts"
I'm on the last day of my quilt retreat. I am sad. It is a kit from 2005. Apparently I wasn't in a hurry to get it done. I am away on a fun quilting retreat with my quilting group. We are sewing up a storm and emptying bobbins at record speed. We are also consuming our recommended daily allowance of chocolate. I decided to re-post one of my Globetrotting videos since I don't have a new video to share today. This is probably my favorite video from Globetrotting block 1. This video was originally posted as part of a tutorial. Do you remember that I mentioned how much I love when hotels have outlets near the nightstand? Well, I do. I really, really do. Sadly, not every hotel loves me that much. I found a way to survive in those hotels: I bring my own extension cord. It usually reaches so that I can charge my phone next to my bed and use it as a reliable alarm clock. This $8 solution lives in my suitcase and makes less-than-wonderful hotel rooms a bit more manageable. Note: the pattern said "avoid using solids," but I'm really happy with how the solids look in this quilt. Ruler breaker, that's me. His nursery is decorated with Peter Rabbit and this quilt hangs on his wall (or will, as soon as I get the sleeve sewn on). Remember how my Celtic Solstice quilt needed a good home? It found one, on my retreat roomie's bed. Since I love her and her birthday is coming soon, she's the new owner of my quilt. It's a baby boy quilt. Guess who it's for? 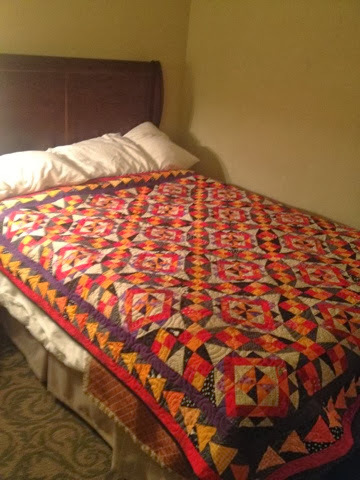 I was thinking of filming some YouTube videos on how to quilt this. Would that interest anyone? Wait a minute -- I'm on a quilt retreat! I don't care what is outside the window; I'm here to quilt! Expect progress pictures as the quilting days go by. I live in New York and we got snow yesterday... a LOT of snow! In case you are wondering, 18 inches of snow is difficult to "angel", especially when there is a layer of ice about half-way down the snow pile. I may have created this angel while wearing my PJs. There are no pictures of it, though, so the world will never really know. I am so tickled to be working on Pat Sloan's Globetrotting block of the month. Read the first tutorial here. Read the third tutorial here. Read the fourth tutorial here. Read the fifth tutorial here. Read the sixth tutorial here. Check out the finished block! Ready to start quilting the next one? I added a little decoration to my quilt studio this week. That thread rack is full of WonderFil InvisiFil (100 weight polyester) and DecoBob (80 weight polyester) threads. The new rack is full of WonderFil Konfetti (50 weight cotton) and Tutti (50 weight cotton) threads. We are getting a tremendous amount of snow today. I am trying to ignore that fact. I have some very large (LARGE!) quilting projects with looming deadlines, so I am focusing on them instead. I have read most (all?) of Stephen King's books. The Stand is my absolute favorite, but there are so many good ones. Hopefully this is one of them. I'll let you know in 18 hours, or in 2 feet of snow... whichever comes first. It was a Moda Club kit from around 2006? 2005? You can read about the original quilt here. 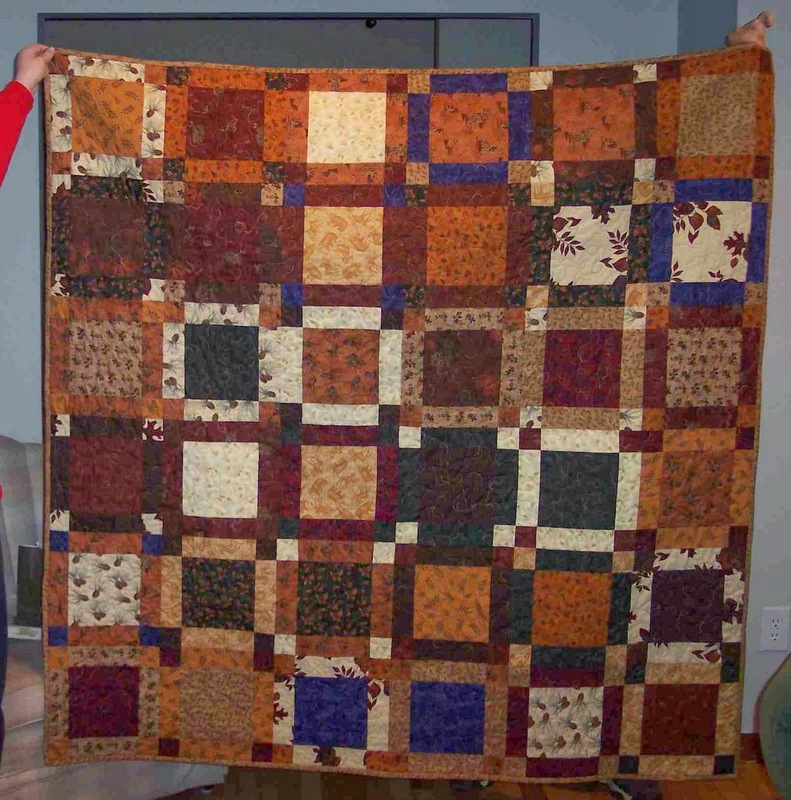 I gave the quilt to my mom's cousin who liked the quilt so much that she asked me to make another one for her brother. I said I would. I think I'll make this a signature on all of my quilts. I'll plan to have a four-inch section of a contrasting fabric. That's my story and I'm sticking with it. The quilting doesn't show well in the photograph, but it is a simple overall leaf pattern. This quilt didn't need any fancy quilting -- it needed to be finished! I hope David likes his quilt, at long last. I went on a mini-rant on Facebook today about a book-to-movie adaptation (A Little Princess -- the book wins!). That rant prompted some discussion about what books we quilters read. I mostly listen to audio books while I quilt or drive, and save my reading time for books that are not available in audio format. I have two very large (secret) quilt projects in my studio right now. I plan to stay home during this next snowstorm and quilt, Quilt, QUILT! 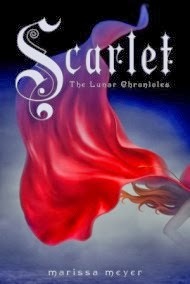 To keep up my quilting motivation, and to stay off Facebook while I am working, I am listening to Cinder by Marissa Meyer. Please don't judge me for enjoying Young Adult Fiction. They can be decent books and usually move fast to keep my interest while I am quilting for hours on end. Do you have a library card? Does your library lend audiobooks? Does your library support audio downloads? Check out your local library! I am THRILLED to announce that I will be teaching at the International Quilt Festival in Houston again this year. Last year was so much fun! I taught some demos for Craftsy's Open Studio. I know that Quilt Festival 2014 will be as much fun (or more!). This year I am teaching classes on the Sweet Sixteens and also on Janome sewing machines. Check out my teaching calendar here.